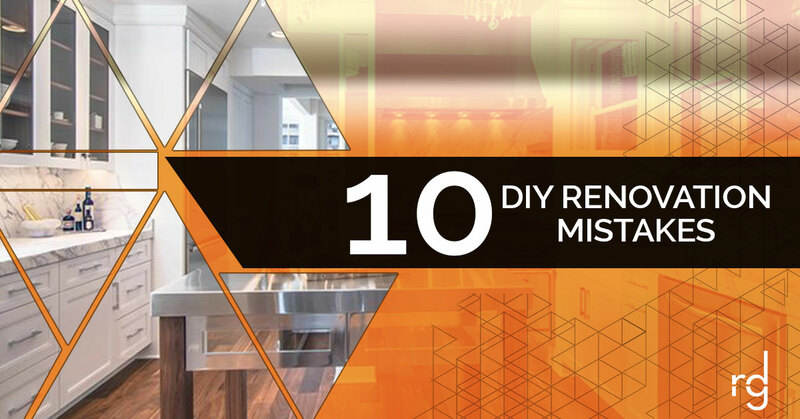 10 DIY Renovation Mistakes - Renovate Your Kitchen With RDGi! | Rinehart Design Group Inc.
Rinehart Design Group Inc. believes that the smallest details can turn any house into a home. We are passionate about making dreams a reality. RDGi understands why homeowners in Florida, North Carolina, Chicago, and Atlanta are motivated to update and renovate their properties in order to bring the character back into their homes. Whether you’re looking to update your home’s interior design with a kitchen remodel including custom kitchen cabinetry, or add designer lighting throughout your space, RDGi is the best interior design team to work with. The team of designers at RDGi strives to achieve any style from contemporary, artfully classic, modern and edgy, and everything in between. Visit our website and browse our gallery to see previous projects we’ve worked on, and contact us to get started! As you browse through online forums to gather design inspiration for your kitchen remodel, you’ll likely come across blogs and “How To” articles that will lead you to believe you can easily renovate your home on your own. Have you ever heard the saying, “somethings are better left to the professionals?” Unless you are a contractor, project manager, and an interior designer, then you’ll want to step aside for this project. When you attempt a DIY project as complex as a kitchen renovation, you’re bound to run into a few bumps in the road that can lead to delays, added expenses, mistakes, frustration, and lots of yelling. Instead, save yourself, your wallet, and your family members from an unnecessary burden and hire RDGi to take it from here. If you’re adamant that a DIY kitchen renovation is completely doable and you’re feeling like you’re up for the challenge, then continue to read more so you can learn what common renovation mistakes you might come across. A kitchen renovation takes time regardless of whether you’re doing it on your own or you’ve hired a contracting company to step in. However, doing a kitchen renovation on your own will certainly make the project seem never-ending. Not to mention, you more than likely have a full-time job, a family, and other responsibilities that require your attention aside from your kitchen renovation. We can assume that you’ve thought about this minor detail before you even thought about doing a DIY renovation. However, this is a very common DIY mistake people make. Online tutorials make everything so simple to do that people often feel a rush of ambition and wind up misusing tools—we all know how that will end up. Kitchen renovations are not cheap. For this reason alone, many people automatically resort to doing it themselves in an effort to “save money.” Along the way, DIYers will lowball themselves and choose materials and supplies that are cheap. While they may still get the job done, how long will the results last? Are you going to go cheap on tools, too? Unlike quality tools that often have safety features and other easy-to-use components, cheap tools can make any DIY project more dangerous and more challenging than necessary. Contradictory to the previous mistake, blowing the budget is another significant mistake DIYers will make. Overspending on a predetermined budget usually happens within the first phase of a kitchen remodel when it is a DIY renovation. Perhaps the reason is because people can justify the costs easier to themselves, as opposed to a professional contractor and design company who have strict orders to stay within the budget. There are many different elements to a kitchen remodel that rely on accurate measurements. Taking good measurements are essential to ordering, managing, and installing materials. Flooring, cabinets, countertops, and appliances all need precise measurements in order for everything to come together as visioned. In addition, good measurements will factor in the cost and determine what the overall budget needs to be set at. Generally, when a team is hired on during a kitchen renovation, they manage and oversee the entire project to ensure that it is all moving along. DIYers do it all—the project management, coordination, ordering, installing, etc. For many people, this leads to disorganization which then leads to utter chaos, and more yelling. Trends come and go, and a lot of the time, that is the main reason why people choose to undergo a kitchen renovation. A professional design team like RDGi will be able to provide insight as to which trends are here to stay and which ones won’t be worth the investment. Our design team can help you choose materials, as well as design and build custom cabinets to ensure you will have the best kitchen renovation. Things always look better on paper but in reality, it’s a completely different story. The same goes for adding that massive kitchen island that is high in the priority list. DIYers will feel relieved because they were able to squeeze it in on a blueprint, but once it’s built and installed, it may not be to scale with the rest of the kitchen design. The same issue can occur with the spacing and height of cabinets. Some, if not most, home remodels require pulling a permit through the city. The worst mistake a DIYer can do is complete a home remodel and fail to pull a permit and address zoning issues later. The DIYers may get away scot free while they are completing the work, but when it comes time to sell the property, the remodel work could come into question. Even worse, the new homeowners could have grounds to sue if something serious happened because of the workmanship. Inevitably, last minute changes will occur. RDGi will intervene and advise you as to whether or not a “small” addition would be possible. For example, adding an additional electrical outlet in the wall may seem easy enough to a DIYer, but in all actuality, it may compromise other aspects of the design and structure. Rinehart Design Group wants people to have the home of their dreams, but not at the cost of common (and avoidable) mistakes. There are plenty of projects that homeowners are fully capable of doing on their own that will save time and money, but a kitchen renovation doesn’t have to be one of them. Kitchen renovations can be costly, time consuming, and stressful events—there is no doubt about it. If you’re looking to make the most of your time and money, save yourself the heartache and hire the professionals at Rinehart Design Group to help you achieve the luxury kitchen design of your dreams. Contact us for a consultation, and get started today! ©2018 Rinehart Design Group - Do not copy. All rights reserved.